As primarily a fan of Elvis Presley’s music and films, I have never been particularly interested in his stint in the U.S. Army, especially the time he spent in Germany. It was not only a forced exile from U.S. soil, but also from the entertainment scene. 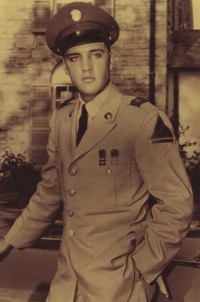 Although his records continued to be released at home while he was in Germany, Private Presley (later sergeant) recorded no songs during that time, nor did make a movie or perform on TV. Since Elvis’s peacetime military service as a jeep driver was relatively mundane, any study of this period usually winds up focusing on his personal life. However, while I am not one of them, many Elvis fans seem to be avidly interested in every aspect of his private life. Also, since a case can be made that events in Elvis’s personal life affected his entertainment career, a close look at his stay in Germany is fair game. 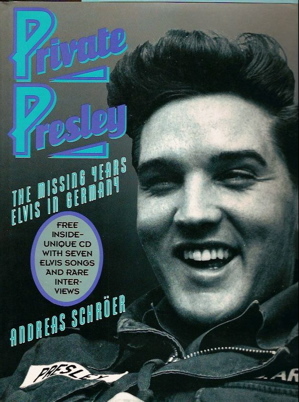 Private Presley: The Missing Years—Elvis in Germany by Andreas Schröer is one of only a handful of books that deal with Elvis’s time in Europe. Originally published in 1993, the book became available again in paperback form in 2004. Since it is available again and is cited as a source in Peter Guralnick’s standard Presley biography, Schröer’s book rates another look. Private Presley sets a high standard for itself. The Introduction claims the book is the “definitive record in words and rare pictures of Elvis Presley’s forgotten eighteen months in Germany.” Does it live up to it’s own billing? Accuracy is important in assessing any non-fiction book, but it is especially crucial in the crowded field of Elvis books, where hearsay and dubious stories are regularly reported as fact. And the key to accuracy is sources. Most Elvis books rely heavily on eyewitness testimony, either the author’s own experiences or gathered through interviews. However, that is not the case with Private Elvis. The author did not witness the events he relates, and the book contains surprisingly few quotes from people who did. What Private Presley says to the reader, then, is basically “trust me.” That results in a high degree of frustration for a skeptical reader (like me), when it comes to determining the accuracy of the book. For example, look at the following statements from Schröer’s book. Both of them cry out for a source reference, but none is given. You get the picture. Schröer fails to provide a mechanism for checking his facts. Furthermore, on a number of occasions, he casts doubt on his own primary source of information, those “press cuttings” collected through the years. He goes along citing from press and magazine articles, assuming they’re dependable, but then inserts a statement like, “ … stories of screaming girls overwhelming the base security to mob Elvis as he disembarked from the train are totally unfounded.” Schröer also refers to newspaper reports that Vernon Presley got black eyes and scratches on his face from fighting in German bars as “erroneous.” There are also claims that German reporters “spiced up” their copy when writing about Elvis. Schröer was right to examine each source for accuracy, but he should simply have discarded the information he judged unreliable. By including such dubious reports, he calls his entire body of print sources into question. And because Peter Guralnick included Schröer’s information in his biography, then that part of Guralnick’s work sits on a shaky foundation as well. Finally, on the subject of accuracy, Private Presley contains a few embarrassing errors in fact. As just one example, the opening chapter states, “Elvis was officially drafted into the army on December 19, 1958.” In fact, Presley had already been in uniform for nine months by that date. The year should have read “1957,” a simple mistake that a pre-publication fact checking of the text should have caught. Taking all of these flaws into consideration, it would seem there is little room for merit in Private Presley. However, the book nevertheless has much to commend it. After I finally got used to the lack of source references in the text (and it took me several chapters to get to that point), the volume’s advantages started to become apparent. First, it is written in clear chronological order. Using lots of statistics, dates, and place names, the narrative takes the reader, without gaps, through the complete 18 months Elvis spent in Europe from the time he arrived there October 1, 1958, until he left on March 2, 1960. Most other books that deal with Elvis’s deployment in Germany either cover only part of that period or jump around, leaving gaps in the time frame. Schröer discusses, fairly I believe, the people who lived in or entered briefly Elvis’s sphere of influence in Germany. Red West and Lamar Fike, the companions he brought across the ocean with him, are shown taking care of daily mundane duties, like shining Elvis’s army boots and providing transportation and physical protection. On the other hand, they are described as “rude and uncouth.” Their alternately childish and heavy-handed actions embarrassed Elvis, and finally led to Elvis sending Red home (although Guralnick contends it was Red’s decision to leave). Also discussed are the women—Elisabeth Stefaniak, Margrit Beurgin, Vera Tschechowa, Ingrid Sauer, Siegrid Schutz, Priscilla Beaulieu—who had relationships of various types with Elvis in Germany. Generally, Schröer properly avoids intimate details, considering how painfully young most of these girls were. Colonel Parker gets his usual typecasting as a villain, although Schröer is a little gentler on Elvis’s manager than most Elvis authors have been. Schröer says Parker spent his time in the states “cynically capitalizing” on “his star’s determination to do his patriotic duty.” While the Colonel was denying RCA’s repeated requests for Elvis to record in Germany, he was also steadfastly refusing army requests for Elvis to perform for the troops or do some Cold War propaganda work. Private Elvis suffers throughout from its dull writing style, which is also awkward at times as a result of its translation from German. However, the narrative picks up the pace during the final couple of chapters, as Schröer tries to explain the changes Elvis underwent during his time in Europe. On the positive side, of course, he met Priscilla, but to Schröer the emotional baggage Elvis took on in Germany far outweighed finding his future wife. 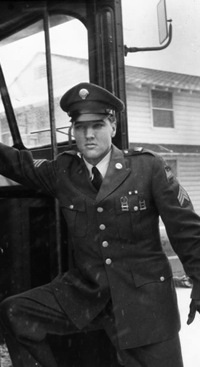 First, Elvis is portrayed as experiencing stress over the possible loss of his entertainment career and the fans he left behind in the U.S. Next came a growing sense of isolation as he increasingly became reclusive in the face of continual demands from fans, the press, the army, and hangers-on. Finally came the pills, Dexedrine, which Schröer says Elvis used to stay awake during army maneuvers and later to fuel his nightspot hopping in Frankfurt. In Schröer’s view, the pills had a devastating effect on Presley. He claims Elvis’s increasing use of Dexedrine played a key role in his “deepening depression, egomania, and paranoia, and his more frequent and increasingly violent temper tantrums” while in Germany. The result was a changed Elvis Presley. “The fans waiting in America,” says Schröer, “were to welcome home a man fundamentally different to the carefree young rocker they had seen proudly displaying his new uniform in Memphis.” Worst of all, in Germany Elvis had taken the “first steps along the road to drug dependency that would end his life” just 17 years later. "An East German newspaper called Presley a tool of 'those persons plotting an atomic war.'"